Because I’m a slacker blogger, this post should have come to you almost two months ago. Why did I wait two moths to give you this all important news? I, the photographer girl, was too lazy to haul pictures off my camera. Until a youth retreat a month and a half later. And I simply respond by rolling my eyes. I hear I’m quite good at it since I do it all the time. So what the heck am I talking about? No, I’m not faking my death like that dude on LiveJournal or anything. I’m dying stuff. Yes, with Joram! The local costumer’s guild decided they wanted to learn to properly dye. We’re not talking RIT and tie-dying here. Though that’s fun in its own right. I mean who doesn’t like tie-dye? I’ve even photographed a tie-dyed bride! It’s not like I don’t have any experience dying things. Do we really want to revisit that couple of months where I went blonde? I didn’t think so. Though I will admit that I had more fun as a blonde. If you want to help me go purple, let me know. 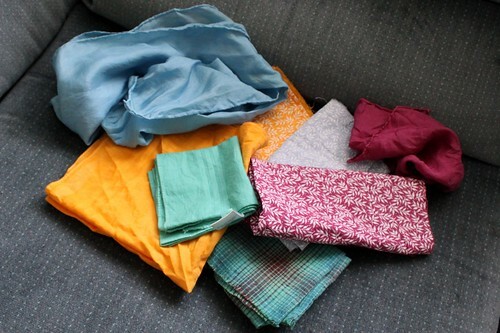 The fun thing about this workshop, seeing how to dye properly. I learned all sorts of neat things like where to get good quality dyes, what will and won’t dye, and how long to leave stuff in the dye bath. 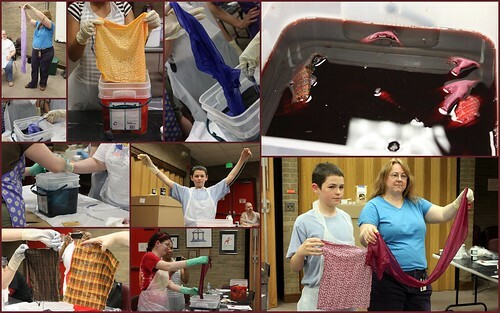 We each got to dye several different fabrics. I loved seeing how the fugly plaid stuff turned out. Some of them came out of the colour bath in interesting shades! I made a Jade Green pocket hankie for Caramon which he loves. Sir Megabyte received a beautiful blue hankie. Joram’s hankie turned out a yellow-orange that is quite the happy colour. I love that the polyester thread of the hankie didn’t take the dye, so you get the white hem stitch looking quite decorative. What really popped though? The white on white fabrics we dyed. The fabric took the dye, but not the pattern. I love a good tone on tone fabric, but this turned out stunning! I love my new scarlet coloured scarf, though it’s a little small. I am going to try to find something I can work it into. Perhaps a hat or an accent piece to a costume? I’m not sure. This was such a fun activity that I really want to do some hand dying now. Seeing some of the things that the instructor showed of originals vs dyed, you can truly change a fugly piece of fabric into something stunning. I’ll never look at fugly fabric the same way again! Trust me, there’s a lot of really UGLY fabric out there that just leaves me shaking my head. About the time I think, “Who in their right mind would purchase THAT” my mother comes along and throws the bolt into her basket. But then, I’ve never said my mother was in her right mind. Now, should I dye myself blue to go see Smurfs?